First off, let's remember that our PS3, back in our last simulation of postseason activity, thought the Giants would lose to the 49ers in the NFC Championship Game. (Though it did have them beating the Patriots. 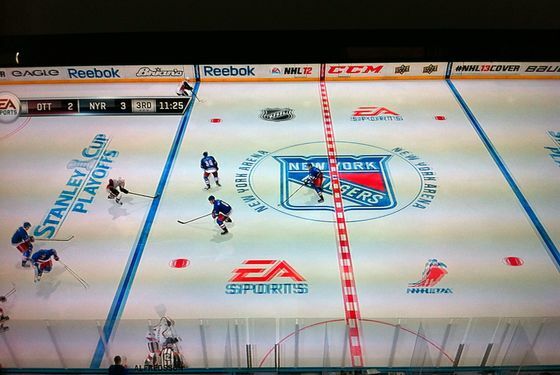 *) So, keeping that in mind ... we're afraid "NHL 12" thinks the New York Rangers will lose to the Ottawa Senators in seven games. And what a seven games: The Rangers lost the first three and came back to win the next two. Then, in Ottawa in Game 6, they went into the third period down 5-1 ... and came back to tie it before Brandon Dubinsky scored 8:37 into OT to force a Game 7. Unfortunately, that one went badly, with the Senators winning 4-2, thanks to two goals from grizzled captain Daniel Alfredsson. So, sorry, guys. Hopefully the PS3 is wrong, again, and we'll make it go through this again in a couple of weeks. By the way, the music in hockey video games is hilarious. It's honestly mostly Billy Idol. After the jump, the pre–Game Seven video. Even if you ignore the fact that, if this series goes seven games, it'll be terrifying, it's tough not to get excited for this thing to start after watching this. * This post has been corrected to show that the video-game Giants defeated the video-game Patriots, not the video-game Colts, in video-game Super Bowl XLVI.